They are the motor for many branches of the economy worldwide: Joining, cutting and surfacing technologies are becoming ever more decisive for industry. From September 25 to 29, 2017, the world's premier fair, SCHWEISSEN & SCHNEIDEN, once more highlighted its position as the most important forum in the sector. Messe Essen and the German Welding Society (DVS), as the ideal sponsor and a longstanding partner, greeted about 50,000 visitors from over 120 countries, this year in Düsseldorf for once because of the modernisation of Messe Essen. These included, above all, decision takers from the sectors of automobile and vehicle construction, shipbuilding, mechanical and installation engineering, pipe fabrication and pipeline construction, mining as well as the building trade, the chemical industry and the manufacture of metal products who generated an order volume amounting to two billion Euro. Thus, the exhibitors' expectations with regard to the business at the fair were surpassed by far. "The expertise of the numerous visitors to the fair was very good and the density of decision takers on a very high level," was the tenor of the exhibitors. In this respect, the good economic situation also played into the hands of the sector: The industry both in the Euro zone and globally is more confident than it has been for years. In Germany, too, it remains on a growth course and the medium-sized industrial enterprises are even showing their euphoria. 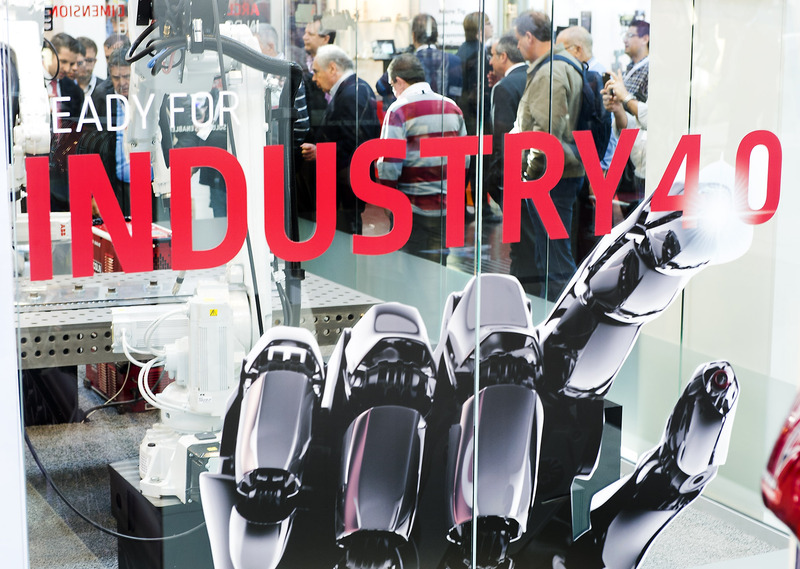 Five days' long, around 1,035 exhibitors (in 2013: 1,017) from 41 nations (in 2013: 40) have presented their innovations at SCHWEISSEN & SCHNEIDEN - in total, the foreign participation was nearly 64 percent (in 2013: 61). Also on the part of the visitors, the fair registered high internationality. 66.3 percent (in 2013: 47.6) of the public arrived from abroad. Moreover, the density of decision takers was, at 83.0 percent, above the already very good value at the preceding event (81.2). The exhibitors rated the visitor structure as very positive all in all. Further satisfaction was ensured by the placing of the companies in the halls which followed five subject areas this year: It was now possible to head for the latest developments and innovations within the entire value added chain in a more targeted and more compact form. This was rated as very good throughout and will be continued at SCHWEISSEN & SCHNEIDEN 2021 in Essen. The visitors also made successful assessments and nearly all of them are planning to take part in the coming edition of the fair (94.0 percent; preceding event: 92.8). 76 percent of the exhibitors (in 2013: 66) and 71 percent of the visitors (in 2013: 64) rated the current economic situation of their companies as favourable to very favourable. The former showed that they were extremely satisfied that the trade visitors were thus very willing to invest: One in three already ordered machines, materials or consumables at the fair or are planning concrete post-fair business. 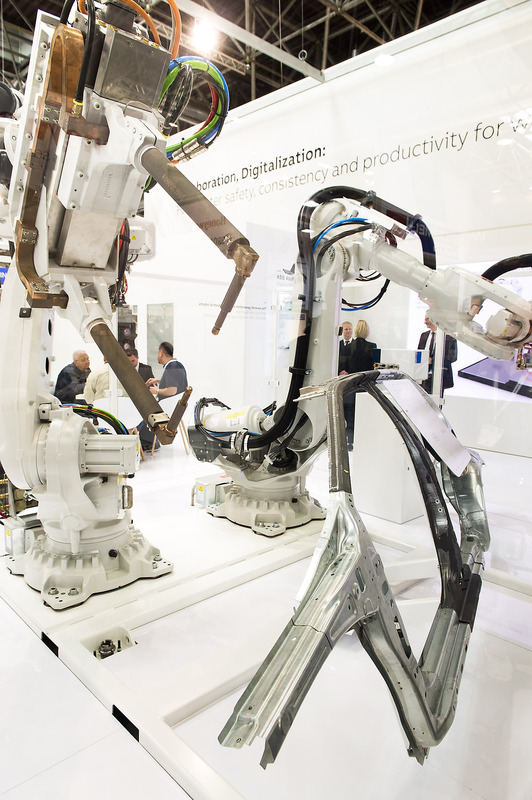 One tendency which emerged at the fair this year was the trade visitors' growing interest in automation and robotics, also in the case of manual welders: In general, the needs are heading towards connectivity because Industry 4.0 as a topic is permeating through the sector. One of the reasons for this is that corresponding systems are becoming increasingly affordable. To the same extent, this applies to additive manufacturing whose significance is increasing even further in sectors with long product life cycles. It has already gained acceptance in the automotive, aviation and heavy machinery industries. Moreover, the areas of application of additive manufacturing, for example, by means of arc technology have grown constantly in the last four years. Dr. Jörg Hildebrand from the Ilmenau University of Technology confirmed that the manufacturing of large and complex structures is a trend which will continue in the future, too. A second trend consists of processing different materials into hybrid structures. At SCHWEISSEN & SCHNEIDEN, global players as well as newcomers introduced their innovations on this subject - e.g. a machine for surface treatment by means of surface welding as well as a new procedure for manufacturing metallic components: With the 3D metal printing process, the revolutionary production technology of 3D metal printing now offers the advantages of three-dimensional printing in the case of metal, too. SCHWEISSEN & SCHNEIDEN went down excellently also as a global platform for exchanging specialist ideas. On the DVS joint booth, the contacts from the various DVS companies were also available to answer the visitors' questions on the subjects of "Modern Training in Welding Technology", "Modern Media", "Network - Career - Research" and "Services for Industry and Skilled Trades". Moreover, a diverse stage programme and various welding trainers on which competitions were offered every day awaited the public at the fair there. Under the overall responsibility of DVS, the promotion of young welders was also continued at SCHWEISSEN & SCHNEIDEN: No fewer than several highlights followed each other with the DVS Student Congress for young scientists as well as the Young Welders' Competitions - three competitions for young welders from Germany, Europe and other nations which have been staged live for the visitors to the fair since 2013. All the events met with a great response from the visitors to the fair and rounded off the range on offer at the fair in a coherent way. "The success of SCHWEISSEN & SCHNEIDEN is also a result of the partnership between DVS and Messe Essen which has lasted over 60 years," was the summary made by the DVS General Manager, Dr. Roland Boecking. "Even now, we are already pleased that the next edition of SCHWEISSEN & SCHNEIDEN will return to its regular location in Essen in four years. We will again offer a comprehensive programme and various competitions then, too." In the meantime, the experts from Messe Essen are paving the way for the companies from sectors dealing with joining, cutting and surfacing technologies to gain access to the growth markets in China, India, Russia and, from January 2018 with the ESSEN WELDING & CUTTING PAVILION / SteelFab, the United Arab Emirates, too. The events and cooperation projects adjusted to the respective markets are organised by Messe Essen together with strong regional partners. DVS supports all the fairs from the SCHWEISSEN & SCHNEIDEN family and promotes the exchange of specialist ideas with fair-accompanying congresses. In September 2021, SCHWEISSEN & SCHNEIDEN will then move to the New Messe Essen. When the current modernisation work on the fair site in Essen has been concluded, exhibitors and visitors will find optimum conditions there - with open, functional architecture, simple orientation, flexible logistics and modern technology. The construction work which started in May 2016 is right on track so that the new foyer covering an area of 2,000 m² and the new Hall 6 will already be inaugurated in November of this year at the end of the first construction phase. The modernisation will be concluded in 2019 so that the 20th international SCHWEISSEN & SCHNEIDEN trade fair will move to one of the technically most modern fair sites in Germany. SCHWEISSEN & SCHNEIDEN 2017 registered 1,035 (1,017) exhibitors from 41 (40) nations. Also including the forecast for the last day of the fair, around 46,000 registered trade visitors from over 120 nations came to the fair. In addition, not only international delegations and guests of honour but also a lot of international press representatives as well as participants of the supporting programme visited the event. "We are very satisfied with SCHWEISSEN & SCHNEIDEN 2017. Here, we reach our core target groups and can hold a lot of high-quality discussions. In particular, we are pleased about the high internationality of the fair - on our booth, the ratio was about 50:50. The good structuring of the exhibitors' booths rounded off the experience at the fair for us. I am certain that we will be involved again in the future, too." "Our impression of SCHWEISSEN & SCHNEIDEN 2017 is definitely positive. We encountered much higher internationality than we had originally expected. In addition to Industry 4.0 and automation processes, the subjects of occupational health and safety and environmental protection emerged as trends which are becoming ever more important. We could use the fair in order to look for and maintain the contacts to our target groups. The number and quality of the visitors to our booth were super - we are very satisfied. We will be involved in the next edition, too, even if perhaps in another order of magnitude." "Already on the occasion of SCHWEISSEN & SCHNEIDEN 2013, we established a lot important contacts on the promoted joint booth for the young innovative companies. Afterwards, there was a constant rise in demand. We are represented worldwide with our highly efficient extraction technology such as the Airtower, the market leader amongst the filter towers, and have 600 units on the market in the meantime. Our participation in the leading fair this year as a single exhibitor is a premiere and we are very satisfied with the result: The inquiries had a high quality and were very interesting for us. Moreover, the visitors have surprised us with their high expertise throughout. A return in 2021 is definitely a must for us." "For us, it was something special to present all the brands from the welding technology of our group of companies with our unique Factory Style fair booth and a very open booth design to the international trade public from the world of welding and cutting. The idea behind it was to show the parent company together with our international subsidiaries and, in particular, also our affiliated companies. The aims not only of bundling and demonstrating our competence in the segment of welding technology optimally for the customers from the different branches of industry but also of making use of our own synergetic effects have proven to be worthwhile. The stream of visitors was exceptionally good and the feedback about our fair booth and about the introduced new product and process solutions even overwhelming." Peter van Berkel, Operations Manager, Red-D-Arc B. V.
"SCHWEISSEN & SCHNEIDEN is the only large fair in Europe at which we are present. This year, we were involved as an exhibitor in Germany for the third time and will probably be an exhibitor also at SteelFab in 2018. The business at the fair went very well. Our expectations were met to the full and we have been able to make a lot of international contacts. The visitors came, for example, from Russia, the Netherlands and the Middle East. This year, we have been able to successfully present our new German business branch on a part of the booth." "We are taking part in SCHWEISSEN & SCHNEIDEN every four years, and always very excited with all the leads when we go home. It is very interesting to join such a large fair and for example to see the changes in the market as well as to meet people, build or strengthen business relationships and to show our products. We make business in 50 countries, but SCHWEISSEN & SCHNEIDEN presents the most international trade fair that we take part in." "As a newcomer, we have been an exhibitor on the joint booth for the young innovative companies which has been promoted by the Federal Ministry for Economic Affairs and Energy. While we used to predominantly offer services, we could this time use a welding robot system in order to demonstrate how customer-specific installations are set up by us, what peculiarities they exhibit and what they achieve. As a result of this, we had significantly more inquiries. The subject of Industry 4.0 is becoming ever more significant because ever more functions are being integrated into the installations, for example, in order to obtain measured values for the documentation of the fabrication quality. That has high practical significance because scrap can be avoided and production standards complied with. Our expectations with regard to the fair have been met to the full and the result is very good. For us, it is the most important trade fair worldwide and the only one at which we experience immediate deals. Our own booth is planned for 2021." "Our participation in SCHWEISSEN & SCHNEIDEN is a permanent constituent of our international marketing concept and we have been involved, so to speak, from the first hour. This year, too, we are very enthusiastic in view of the gigantic response on our booth: This year's guiding idea for our booth design related to the three Rs, "Real, Raw & Radical", which also matches our technology in a fantastic way. Our X8 flagship continues to be the highlight at the fair and enjoys the greatest popularity. The onrush on our booth was sensational and already surpassed all our expectations well before the end of the fair."